Sustainability has always been part of my creed. I think it may have gotten its roots in the recycling I did in college, returning the cans and bottles from house parties to get the nickels which formed a part of my fraternity's budget. Or maybe it was shortly after college when I was intrigued by the idea of a solar watch, which is still ticking without batteries 15 years later. Whatever the exact origin, certainly living in Northern California has only cemented my practices: I am always reminding my housemates to recycle and compost more; I installed insulation in my attic and walls, I put in low-flow shower heads and LED lights across my home, and I installed solar panels on my home a few years ago which now powers my wood shop and my electric car. All my wood is supplied via distributors that are members of the Forest Stewardship Council, which promotes sustainable and responsible harvesting. All the wood shavings are composted - some weeks, this can be over one hundred gallons of wood chips (but most weeks it's less than five). And as you may have read in the last blog post, I try my darnedest to put every last scrap to use. And - the focus of this post - 10% of my sales are invested in net new solar energy projects. I've partnered with a company who has a unique business model. In short, you "adopt" a solar panel from them for a few hundred dollars - say, $300. They aggregate these adoptions to fund the installation of mid-size commercial projects, such as on a church, brewery, or a mall. Over the term of the adoption - between five to ten years - the savings from the solar electricity are paid back to the adoptive owner (i.e. : me) via a credit on your utility bill. The aggregate total of those credits are estimated to nominally exceed the initial adoption, say, $350. After that term, the "host roof" owner (i.e. : the brewery) has effectively paid off the financing for the installation, and then will get the benefit, cost free, of all the electricity generated by those panels for their remaining 10-25 years of life. So, to be clear, my 10% commitment is not a donation, but rather, comes back to me over time as - if everything goes well - slightly more money. But it does enable the creation of net new projects that would not have been built, or perhaps built only much later. And this creates jobs in the U.S., and is just one small thing I can do to help wean us of our addiction to fossil fuels. I started Branching Out Solar to develop solutions to the "split incentive" problem in solar, where the interests of the roof owner who has the ability to install solar and the building occupant who has the motivation to lower their utility bill are not aligned. Though I haven't yet identified any winning solutions for that myself, the adopted panel model might be a solution for at least a few folks, and it also has the benefit of being a small enough buy-in for the first panel that it can be given as a gift. [Feb 2019 update: Branching Out Solar has shuttered]. So In addition to purchasing a number of panels myself, I'm helping this solar company - Arcadia Power - build their solar business. In particular, in more expensive markets, $300 is about the amount a real estate agent might spend on a gift to help a new homeowner celebrate their just-closed home purchase. A typical gift may be a home warranty, but for many who have had to interact with home warranties over the years, as an insurance company trying to minimize their claims, they can be exceedingly difficult to coordinate a repair. So an agent may wish to associate themselves with a gift that has a positive association, beyond the obvious benefit of the utility credit. To promote that idea, and am working with a few agents in the San Francisco and Phoenix areas. Know an agent who might be interested in this, or a home shopper that might want to convince their agent to consider this as a gift? Referrals are appreciated - or just point them to the gift idea on the website. [Feb 2019 update: Branching Out Solar has shuttered, so link removed]. How can you get more directly involved? Even if you're not a real estate agent, you can adopt a panel yourself! Yes, an even better thing would be to install solar on your own home, both from the perspective of size of impact and dollar benefit to yourself. For a quick back of the envelope assessment whether solar makes even makes sense for you (assuming you own the roof and have the ability to install), check out Google's Sun Roof project: simply type in your address and your monthly electric bill, and they'll do a quick calculation for you. 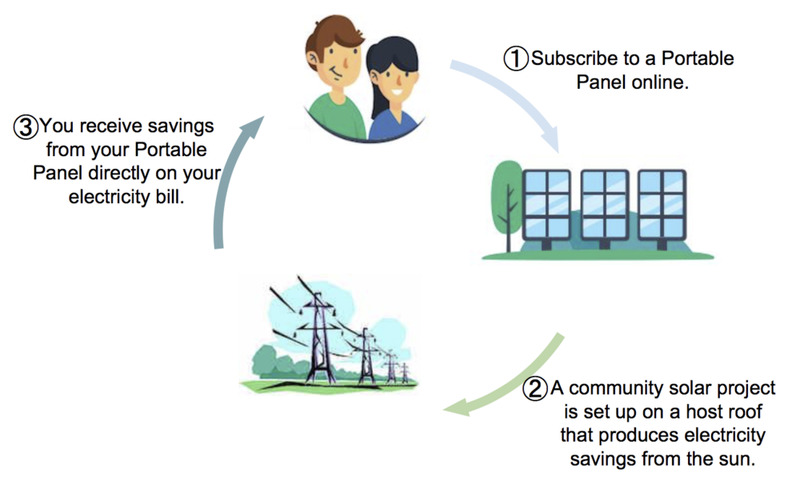 But if that's not an option for any number of reasons, if you have an electric utility bill with any of about 50 utilities that Arcadia Power partners with, you can adopt a panel yourself here. (Full disclosure: if you use that link, I get a small referral fee). [4/5/2019 update: referral problem / adopt a panel program ended by Arcadia Power; links removed]. Why this focus on "net new"? What does it mean? I had the opportunity at Google to work on a few energy projects as part of Google's overall commitment to source 100% of its energy from renewables. The financing of renewable projects - and, in fact, all generation projects - is incredibly complex; this is an area where I only scratched the surface myself, and I won't bore you with the gritty details. But the short of it is that a generator may have a life of 20-40 years, or even more, whereas the direct customers of that plant may only want to make a commitment to purchase that electricity for a shorter horizon, perhaps 5-10 years. While that initial commitment may be sufficient to get the financing to build the project, once that initial term expires, there's a plant that can keep producing electricity if only someone would sign up to buy the output. But Google takes the perspective that that power will be purchased by someone regardless, and that plant is already built, so entering into a contract with such a facility does not change the net amount of renewables in the world. Google, with a solid balance sheet and a fair amount of respect in the field, can bring into fruition brand new projects that create more new clean energy. I respect and understand that "net new" mentality, which can gradually shift our economy to clean fuels rather than just "greenwashing" your own carbon footprint by chasing after carbon offsets of projects already built. And so, similarly, I am dedicating my 10% of sales to only go to net new projects. Though I know this is not the reason you would buy a lamp or commission a custom bench from me, I hope in sharing a little of these details you get a sense of how your purchase is more than just a lamp or a vase, but an investment in the community and our future. And I hope you will also consider doing something new in your community to help make a difference in our environment. I'd love to hear what you're already doing in the energy space, or what you're considering doing!